20x16x2 Titan-Flo Grease Baffle Filter Fire Patrol "A" | Air Filters, Inc.
20x16x2 Titan-Flo Grease Baffle Filter Fire Patrol 304 "S"
20x16x2 Titan-Flo Grease Baffle Filter Fire Patrol 430 "S"
Titan-Flo™ Aluminum Grease Baffle Filters designed to be used in grease hoods and fryers. The FIRE PATROL "A" was created to replace the mesh style filters, without concern for costly hood modification. Air Filters, Inc.™ Titan-Flo™ Aluminum Grease Baffle Filters are made from a unique roll formed baffle, designed to prevent flame from penetrating through the filter into the duct work. Two layers of equally spaced baffles create an air flow which gives unsurpassed performance in efficient grease removal. Smooth baffle surfaces cause a continuous run-off, allowing grease to be safely deposited in collection troughs. Classified by Underwriters Laboratory Inc. as to flammability only after exposed to grease-laden air. One piece U-channels are riveted in a staggered arrangement creating a baffle. 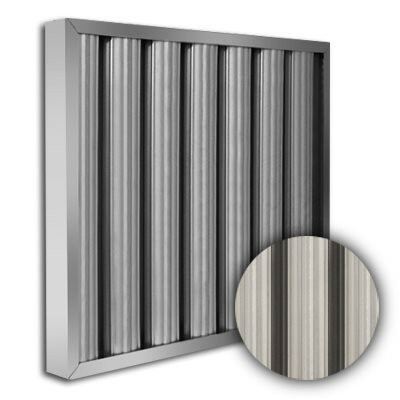 Baffle air filters also show superior performance in some paint booth applications. Solids, such as grease, are deposited directly onto baffles. 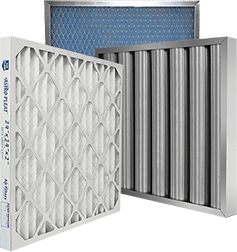 Baffle air filters will not permit grease buildup due to the specially designed drain openings that allow continuous drainage from the filters. Clean easily with soap and water, pressure wash, soak, or dishwasher.